This page: The Monpelier, Castle Gate, Wilcox and Winnemucca Robberies, Whispering Smith. 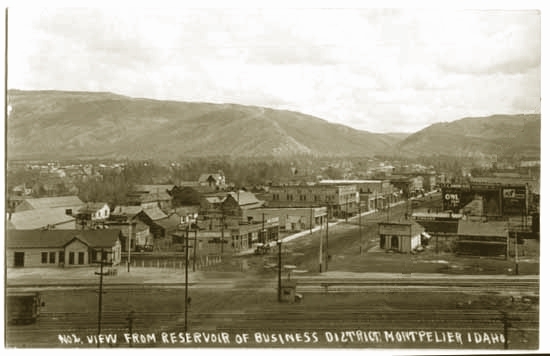 On August 13, 1896, shortly before closing time, three men, hitched their horses to a hitching rail across the street from the Bank of Montpelier, Idaho. The bank, a one-story false fronted structure, had been founded 5 years earlier by G. C. Gray who served as cashier. Later the bank would move to a larger two-story brick building before it failed in 1924. Two of the men wearing bandanas came across the street and forced Gray who was on the sidewalk in front of the bank into the bank building. Inside, the teller, A. N. MacKintosh, was forced against a wall, and the two proceeded to relieve the bank of an estimated $16,500. From his position against the wall, MacKintosh was able to see through the window the third man, who he was later able to identify as Bob Meeks, tending to the get-away horses. The two left the bank and and the three rode leisurely away. Chase was given by Deputy Sheriff Fred Cruikshank on a bicycle and by lawyer John A. Bagley on horse back. Sheriff Jefferson M. Davis soon organized a posse which also gave chase, but the three made good their escape. Later, based on the identification by MacKintosh, Meeks was arrested and convicted of the robbery. The other two, now believed to have been Butch Cassidy and Elzy Lay, were never arrested for the robbery. In April, 1897, a lone cowboy arrived in Castle Gate, Utah, a large coal camp owned by the Pleasant Valley Coal Company. The cowboy hitched his horse and proceeded to the saloon. When the whistle of the noon train was heard, the cowboy rode down to the depot and watched the puffing train pull into the station. The cowboy sat and watched. Each day for a week, the cowboy followed the same routine until the locals paid no attention apparently thinking it to be merely a cowboy eccentricity. On Wednesday, April 21, the same routine was followed. On that afternoon, however, the baggage and express was unloaded into the baggage room, followed by the mining company paymaster, E. L. Carpenter and two guards. From the baggage room, the three emerged bearing three bags of coin and bank notes, a total of $8,800.00. The three headed to the Company office, on the second floor of the company store, some 75 yards from the depot. Access to the office was by way of an outside stairway. In the above photo, the Company office is the two-story stone building immediately on the other side of the tipple. Near the stairway, two cowboys loitered. Passersby paid no heed to the lone cowboy or to the other two. The lone cowboy, vi et armis, relieved Carpenter of a bag holding $8,000, while one of the loiterers took from one of the guards a bag of coin. A customer in the store, Frank Caffey, attempted to interfere with the proceedings but was greeted by a six shooter aimed at his ample belly. The three cowboys, now believed to be Butch Cassidy, Elzy Lay, and possibly a cowboy named Fowler, accompanied by several others, rode off to the south pursued by Caffey in a buggy; an unarmed citizen on horseback shouting, "Bring that money back"; and by a switch engine loaded with an impromtu posse. Neither Caffey, the citizen, or the switch engine were able to catch up with the robbers. Attempts to reach the Sheriff by telephone were unsuccessful. The telephone line had been cut. Remains of express car after Wilcox robbery. At 1:00 a.m. June 2, 1899, a trestle across the Union Pacific near Wilcox, Wyoming, about six miles west of Old Rock Creek Station, was barricaded, forcing the Overland Flyer to a halt. Men, wearing masks made from white napkins possibly stolen from a Harvey House Restaurant, boarded the train. One of the men, after attempting to force the engineer to pull the train forward, himself pulled the train forward. The trestle was then dyamited so as to prevent the second section of the train from catching up. Additionally, two cars were separated from the train. The train was then pulled forward for about two miles and stopped. There the express car was surrounded. and the attendant by the name of E. C. Woodcock was ordered by the gang to open the door. When he refused, the car was blown up. 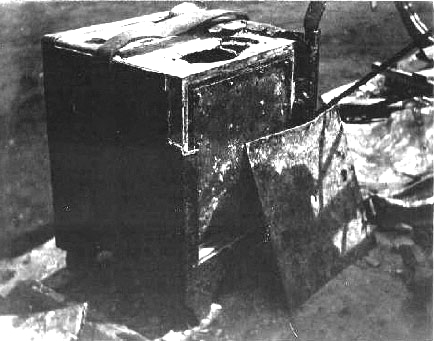 Woodcock, from the concussion received in the explosion, was unable to remember the combination to the safe. Whereupon, the safe was blown up and robbed of $30,000. Some of the bank notes were scorched by the explosion or stained with raspberries also in the car. 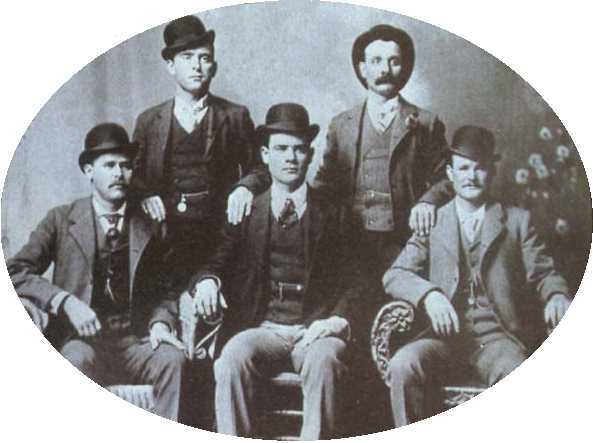 There are some who claim that the robbery was the work of the Hole-in-the-Wall gang, and that "Butch" Cassidy and this gang are the guilty ones. Some of the gang are said to have been returning from the south where they wintered, and this was the spring opening." Remains of the express car safe. and the train robbers made their escape by swimming across the river. One is about five feet nine or ten inches in height; about 26 years old, light complexion, inclined to be florid; light hair and eyes; Weight about 160 pounds; had a nickel-plated revolver with bone or pear handle. Another of the men is about five foot six inches tall; dark complexion; dark or black mustache; dark eyes. Robber No. 2 is about five feet eight inches tall. In addition to $200.00 cash, they took from the store skogy boots, cowboy spurs and overalls, blue flannel shirts, camel's hair underwear, brown gauntlet goves, pocket knivies, a Meanea bridle, with chain and bit. 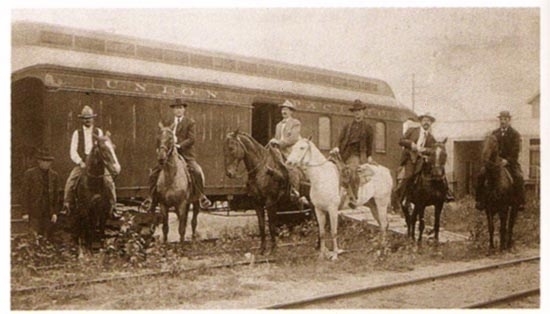 On August 29, 1900, train robbers, using the same modus operandi robbed the Union Pacific No. 3 train near Tipton, Wyoming of $50,000 in gold. As fate would have it, Woodcock was again the express car attendant. This time he opened the door. At the time, it was believed that five robbers participated in the holdup. The robbers were pursued by a possee led by Sheriff McDaniel of Carbon County, Sheriff Peter Swanson of Sweetwater County and United States Marshal Frank Hadsell until the tracks of the robbers were obliterated by a rain. Five years later Ed Rankin, employed on a construction crew for the Farris-Haggarty tramway, discovered near the headwaters of Cow Creek three bags bags in which the money from the Tipton Robbery had originally been held. The Wilcox and Tipton robberies, although sucessful, marked if not the beginning of the end of the Wild Bunch at least the onset of the beginning of the end. 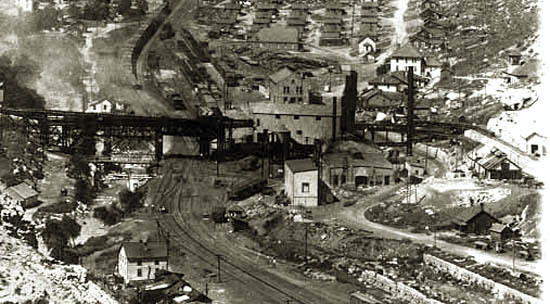 In 1897, E. H. Harriman obtained control of the railroad and began a major reconstruction of the road. Mr. Harriman took a personal interest in all aspects of the operation of the railroad including apprehension of those robbing his trains. Mr. Harriman was not a man to be triffled with. Among his efforts was the appointment of special agents including Timothy Keliher, Joe LeFors, and Thomas Jefferson Carr. At the same time, modern communications in the form of the telephone were extending out from Cheyenne. 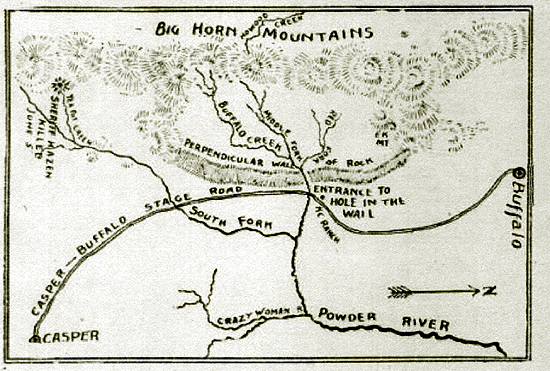 By the 1890's long distance service had begun connecting major towns of Wyoming. The company was notified of the Tipton robbery by the railway conductor calling from a pay telephone. In the final analysis, instant communications by telephone proved the undoing of the Wild Bunch. When Harvey Logan escaped from jail in Tennessee, his movements were traced by phone. and the entrance to the Hole-in-the-Wall. 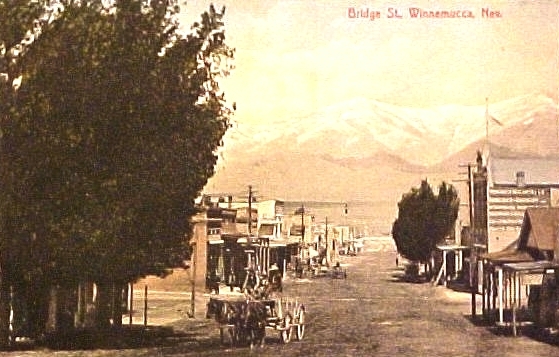 On September 19, 1900, the First National Bank at the corner of Bridge and Fourth Streets in Winnemucca, Nevada, was robbed. The bank robbers were identified as men who had been camping in the area for at least 10 days. Winnemucca, Nevada, approx. 1905. Bank is the one-story brick building on the corner, on the left, past the trees and wagon. It is the popular belief that Butch Cassidy committed both robberies. The difficulty, however, is that there simply was not enough time for Cassidy to get from Tipton to Winnemucca by horseback in the time available between the two robberies. The popular myth is that the photo at the top of the page was mailed to George S. Nixon, the president of the bank, with a "thank you" note by Cassidy. This, however, is not true. The photographer, John Swartz, thought the subjects of the photo were so distinquished that a copy of the photo should be displayed as advertizing for his studio. As luck would have it, a Wells Fargo office was only a block away at 817 Main. A Wells Fargo agent recognized the subjects in the photo and sent a copy to Pinkertons, who, in turn, sent a copy to Nixon. Nixon averred that Cassidy was not one of the robbers. This, however, does not eliminate the connection between the Winnemucca robbery and Wyoming. Several sources now contend that the robbery was in fact commited by the Whitney brothers, Hugh and Charley, and their partner Charley Manning, who frequented Wyoming's Star Valley. It is, however, doubtful that the Whitney Brothers pulled off the heist. At the time, Hugh would have only been 12 years old and Charley 10. For discussion of the Whitney Brothers see Cokeville. L to R: Standing, Unidentified; On horse, George Hiatt, Timothy Keliher, Joe Lefors, H. Davis, S. Funk, Thomas Jefferson Carr. The Wyoming division of the Union Pacific had long been a Mecca for outlaws. The mountainous region on each side of the road, within an average distance of a hundred miles, afforded opportunities for the "get-away" which is essential in the highwayman's profession. The trains were held up early in the evening, and before a posse could be organized the bandits were in the Hole-in-the-Wall-country to the north, or in Brown's Park, or the North Park country south, where the trail was invariably lost. Mr. Harriman, with his knowledge of the horse, suggested that we find horses that could go one hundred miles in a day and keep them in the service of our special agents, to be moved about from place to place on trains and in the country. This was done and cured the trouble. 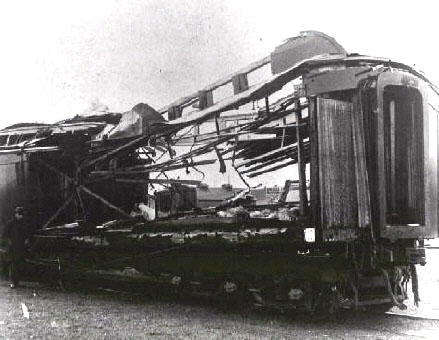 Thereafter the Union Pacific suffered no holdups, although the Northern Pacific, Great Northern, and Denver & Rio Grande were frequently victims. Our posse of train guards, which became quite celebrated, was composed of the best hunters and guides. One of them � Joe La Force [sic] � was made famous in Spearman's novel, " Whispering Smith." Sam Lawson, formerly guide and hunter for Lord and Lady Brassey, was always to be depended upon. Mr. Timothy Keliher had immediate charge of the guards and their equipment, and so maneuvered them that complete exemption was obtained from attacks. As quoted by Kennan, George: E. H. Harriman: A Biography Houghton Mifflin Company, Boston, 1922. Next Page: Butch Cassidy and Sundance Kid in Argentina.